Round-trip time (RTT) is the duration, measured in milliseconds, from when a browser sends a request to when it receives a response from a server. It’s a key performance metric for web applications and one of the main factors, along with Time to First Byte (TTFB), when measuring page load time and network latency. RTT is typically measured using a ping — a command-line tool that bounces a request off a server and calculates the time taken to reach a user device. Actual RTT may be higher than that measured by the ping due to server throttling and network congestion. Distance – The length a signal has to travel correlates with the time taken for a request to reach a server and a response to reach a browser. Transmission medium – The medium used to route a signal (e.g., copper wire, fiber optic cables) can impact how quickly a request is received by a server and routed back to a user. Number of network hops – Intermediate routers or servers take time to process a signal, increasing RTT. The more hops a signal has to travel through, the higher the RTT. Traffic levels – RTT typically increases when a network is congested with high levels of traffic. Conversely, low traffic times can result in decreased RTT. Server response time – The time taken for a target server to respond to a request depends on its processing capacity, the number of requests being handled and the nature of the request (i.e., how much server-side work is required). A longer server response time increases RTT. Points of Presence (PoPs) – A CDN maintains a network of geographically dispersed PoPs—data centers, each containing cached copies of site content, which are responsible for communicating with site visitors in their vicinity. They reduce the distance a signal has to travel and the number of network hops needed to reach a server. Web caching – A CDN caches HTML, media, and even dynamically generated content on a PoP in a user’s geographical vicinity. In many cases, a user’s request can be addressed by a local PoP and does not need to travel to an origin server, thereby reducing RTT. Load distribution – During high traffic times, CDNs route requests through backup servers with lower network congestion, speeding up server response time and reducing RTT. Scalability – A CDN service operates in the cloud, enabling high scalability and the ability to process a near limitless number of user requests. This eliminates the possibility of server side bottlenecks. 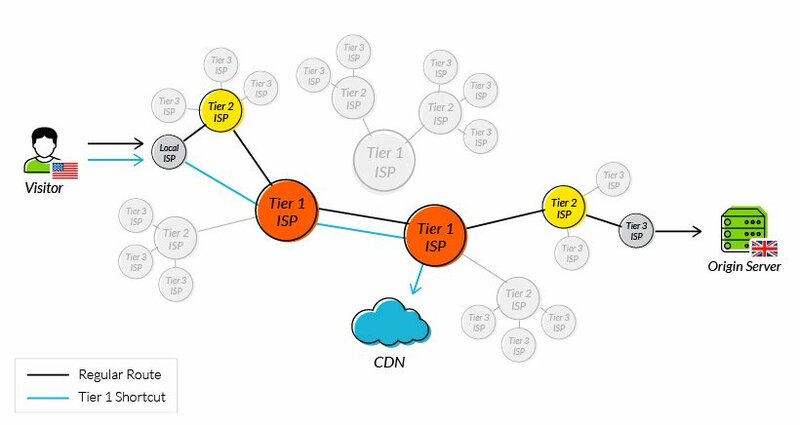 Tier 1 access – CDNs have agreements with the biggest Internet Service Providers (ISPs) to provide Tier 1 access to the internet backbone. This reduces the number of network hops a connection must travel through, greatly reducing a signal’s round trip time. One of the original issues CDNs were designed to solve was how to reduce round trip time. By addressing the points outlined above, they have been largely successful, and it’s now reasonable to expect a decrease in your RTT of 50% or more after onboarding a CDN service.